Lucero Bakery has been serving Angelino's authentic filled churros way before its recent craze. Churros are a favorite to amusement park goers across the United States, and although the origin of where churros first came from and which country concocted these delicious sugary treats still remains uncertain, one thing's for sure—churros have been a family favorite for generations. For decades, churros have always been made the same. In fact, the process is pretty easy and it starts with the freshly made dough, which is formed into its famous straight prism cylinder shape. The dough is then dipped and fried at hot temperatures until it becomes golden brown and then rolled into a sugar and cinnamon mixture. Like the traditional flan's counterpart—the choco-flan (half chocolate cake and half flan) has become a favorite. Traditional churros too have a counterpart, and Lucero Bakery in Los Angeles has been serving these filled churros to Angelinos since before they became the new big craze. Filled Churros may be the new craze, but it's no secret to the folks over at Lucero Bakery. Lucero Bakery is family-owned and founded in the 1980s. In business for over 30 years, Lucero Bakery has been serving its loyal clientele and is a favorite Mexican bakery to many. While they have delicious pan dulce (Mexican sweet bread) and tres leches cake (three milks cake), it’s their filled churros that keep Angelinos coming back for more. "My favorite are the cajeta filled churros. If there's a line, I'll wait," says Sandra Henderson of South Gate, as she frequents the Lucero Bakery in Maywood. These aren’t your amusement park or Costco churros either, these churros are made fresh daily and never frozen. With your choice of cajeta (goat’s milk), guava, or chocolate filling, it’s hard to just choose one. 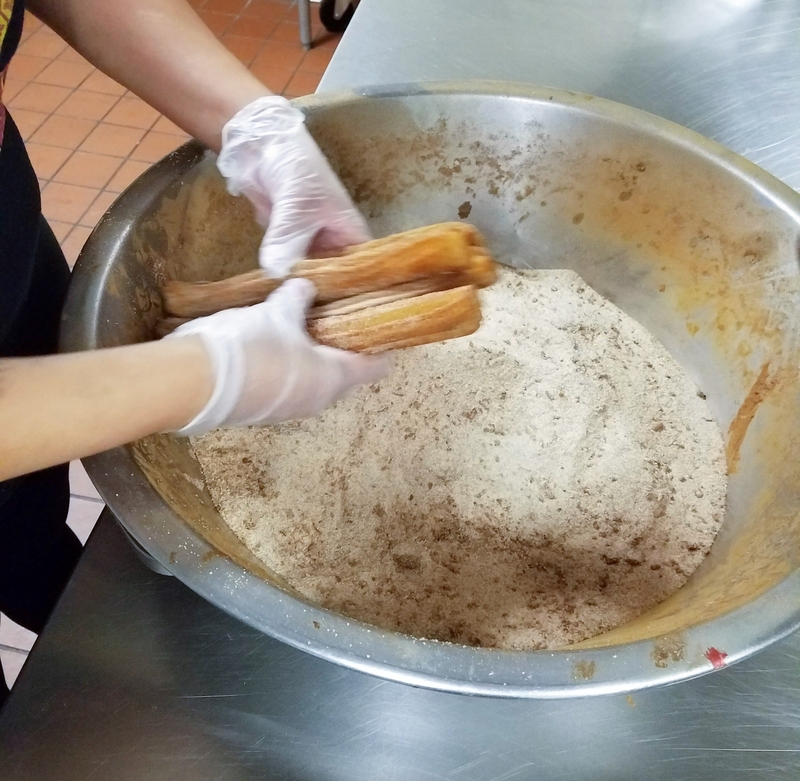 When asked which is the most popular, Lucero Bakery employee and family friend Alice affirms that the cajeta-filled churro is the most popular. Of course, credit goes to the family secret dough recipe for these famous churros, and the proof is that people who visit the bakery leave with not 1 churro, but a box full. It's no surprise that their Yelp reviews are above to near-perfect Five Stars. Their first bakery opened in Commerce and has been in business for 35 years. Due to a fire a few years back, they had to momentarily relocate less than 1 mile down the street to Bell Gardens while repairs went under way in Commerce. Doors have been reopened since at the Commerce Bakery and they now operate the business from both locations. Their 3rd bakery location is in Maywood and has been in business for over 16 years. There are future plans to expand the Commerce bakery, which will include a sitting area and an expansion to their kitchen and baking station. This is good news for loyal customers, because along with the new changes, there are also plans to adding new flavors to the famous churro fillings. The churro filling station is where traditional churros get a makeover with cajeta, guava, or chocolate filling. Lucero Bakery is not only known for their churros, but has tres leches cake, pan dulce, and even chocolate covered strawberries for every and any occasion. Make sure to visit Lucero Bakery when you're in the area and try their filled churros. They are located at 6200 Gage Ave, Bell Gardens, CA 90201 and can be reached at (323) 773-7476. See more photos on my blog and let me know which is your favorite filled churro!